Want to decorate your cake and achieve a flawlessly smooth finish? Then roll out sugarpaste (sometimes called fondant or roll out icing) is the easiest and most popular way to cover your cake base. It is easy to work out how much sugarpaste you will need - just use our Ready Reckoner as a guide, and remember to allow extra if you plan to cover your cakeboard too. Sweet Success sugarpastes are designed to be as easy as possible to use, and also to taste less sweet than some other brands. 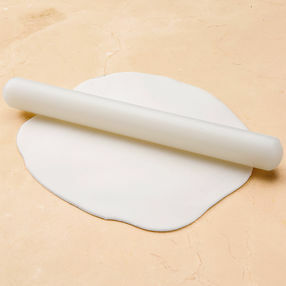 Just use a little icing sugar on your surface, knead your sugarpaste for a few minutes and then roll out with a rolling pin to a thickness of approx 5mm. Your sugarpaste is now ready to cover your cake! But don't forget the buttercream crumb coat on your cake otherwise your sugarpaste wont stick in place! We have 4 varieties of our sugarpastes available; Sweet Silk is our original brilliant white sugarpaste, designed to be as white as royal icing it can be flavoured and coloured using professional food colouring pastes. Our sugarpaste won't dry, tear or crack and that ugly elephant skin that you can get with some brands is now a thing of the past with our flexible paste! Reformulated back in 2014, our Silk range has been getting rave reviews ever since! Ivory Silk is a traditional ivory shade, and will match royal icing trim coloured with Sugarflair Caramel Ivory. It is a stunning bridal ivory colour so will be perfect for your wedding cakes! Chocolate Silk is a roll out chocolate sugarpaste ideal for creating beautiful chocolate wedding cakes, especially when combined with our Death by Chocolate cake bases! Covering a cake with Chocolate Silk is much easier than using real couverture chocolate - it does not need tempering, and there is much less risk of it melting in a hot marquee! Made with real 100% unsweetened Belgian chocolate, Chocolate Silk has a truly intense chocolate flavour. As it contains cocoa solids, which are one of the hardest fats available, it is also a very firm paste which needs warming slightly and kneading well to make it soft and pliable before use. The ideal working temperature for Chocolate Silk is 28 degrees celsius, so if you have an electronic probe thermometer try testing the temperature before rolling out. If you try to roll out and use Chocolate Silk when it is not warm and pliable enough, you may find it cracks over the corners of your cake - a good tip when using it for the first time is to test the paste out first by covering an upturned bowl or dummy, to make sure you have it warm enough. White Chocolate Silk is also now available - flavoured with cocoa butter, this is great for covering cakes and also works well for modelling. Pale cream in colour, it takes further colours extremely well and tastes delicious too! Both of our Chocolate Silk pastes can be used for modelling when mixed with half a teaspoon of tylo for every 250g of sugarpaste. Need to work out how much sugarpaste you need to cover your cake? See our handy guide here!